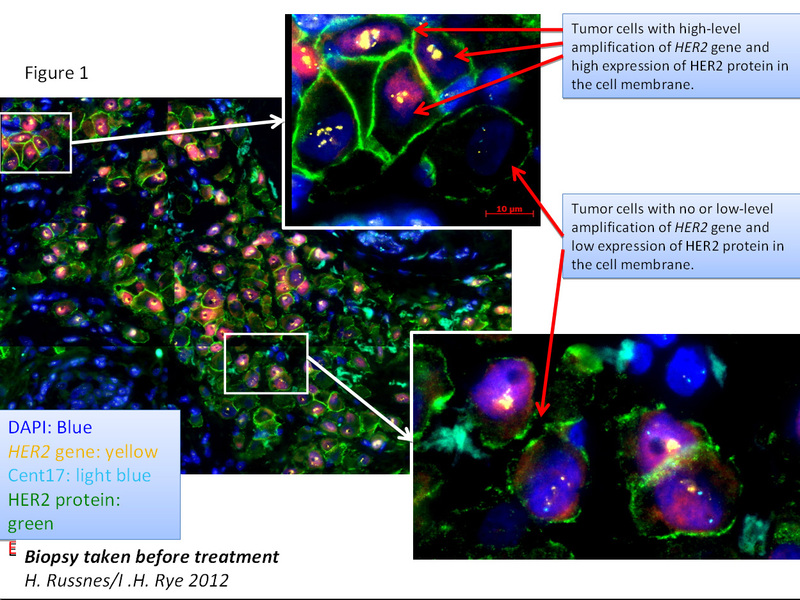 This research project - entitled "Actionable Targets in Cancer Metastasis - from Bed to Bench to Byte to Bedside" - and focusing on intratumoral heterogeneity and personal-adapted treatment of metastatic melanoma, breast-and colorectal carcinoma - has recently been granted with 22.8 mill NOK from the Norwegian Research Council. The granted project is based in an integrated collaboration between basic research- and clinical departments located either at Oslo University Hospital (OUS) or Akershus University Hospital (Ahus) and is funded for four years. Principle Investigators are Gunhild M. Mælandsmo from Department of Tumor Biology and Anne-Lise Børresen-Dale from the Department of Genetics, both at Institute for Cancer Research, OUS. Cancer is a genetic disease arising as a clone expanding in an unregulated fashion because of acquired mutations. Expansion of multiple clones within a tumor will result in intratumoral heterogeneity  some clones being more aggressive, having extended ability to metastasize and develop treatment resistance. The consequence is that the genetic portrait found in a metastatic lesion seldom mirrors the genetics of the primary tumor. 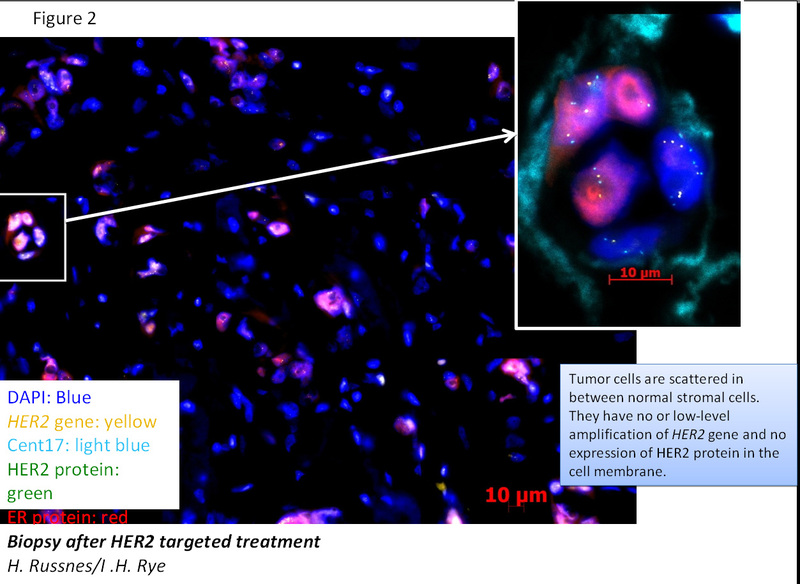 Figure 1 and 2 exemplifies intratumoral heterogeneity by showing HER2 amplification and protein expression in a breast cancer biopsy before and after HER2-targeted treatment. Cancer treatment will in the future be adapted to the individual patient needs. This is driven by improvements in technologies, making us able to identify molecular changes present in a particular tumor, and also by advancement in molecular therapies targeting the identified abnormalities. Given the current restrictions in the regulation of clinical trials, personalized therapy will in the near future mainly be offered patients with recurrent disease and with palliative intentions. Our hypothesis is that personal-adapted therapy will only work if targeted to actionable regulatory proteins present in the life-threatening metastatic lesion(s). This opinion contrasts current clinical practice where treatment decisions are based on features and characteristics of the primary tumor. Clinical trials; An important goal of this subproject is to establish the necessary infrastructure and multidisciplinary teams to gain experience and carry out personal-adapted clinical trials. We plan to offer approved targeted therapy to patients where biopsies from the metastatic lesion has confirmed presence of the corresponding actionable target. The goal is to enroll 25-30 patients on intention-to-treat basis. The effect of the targeted therapy will be evaluated by radiology (RESICT criteria) and also by examination of molecular effect in the targeted pathway in the metastatic lesion. Explorative study; The goal is to identify and validate novel actionable molecular targets, and to study the molecular basis for treatment failure, in metastatic breast- and colorectal cancer and in melanoma. This will be done by multilevel molecular characterization (genomics, transcriptomics, proteomics and epigenomics) of samples from colorectal liver metastases and form serial metastatic biopsies in breast and melanoma. Promising findings will be validated in model systems and in archived patient material. Computational integration; Molecular and clinical data will be integrated in a systems biology approach, and the optimal drug  target combination sought identified.